Being pregnant is (of course) a joy, but it also means giving up some fun foods (sushi, cold-cuts, wine) and activities (high-intensity workouts) for nine months. Pregnant women also have to be careful about their skin-care, particularly because several ingredients that disrupt the skin barrier ? effective acne-fighting ingredients like benzoyl peroxide and salicylic acid or fine-line diminishers like retinoids ? are exactly the things doctors would urge patients to avoid. That can be bad news to moms-to-be, whose acne and other skin conditions may get worse during this period. To find the best alternatives based on skin?s needs, we spoke to five dermatologists about what ingredients to absolutely avoid during pregnancy and the best products to tackle problems like acne. Says Dr. Jennifer MacGregor of Union Square Dermatology: ?Regardless of your skin issue, get a recommendation from your dermatologist and check with your OB before trying to conceive, or as soon as you find out you are pregnant.? Unfortunately, retinoids (and retinols), the Vitamin A?derived holy-grail ingredient that works wonders on both acne and fine lines by promoting skin-cell turnover, are considered unsafe to use during pregnancy. So how should pregnant women address acne if many go-to products contain retinoids and salicylic acids? All five of our experts recommended azelaic acid, a topical that is used for acne and rosacea. It works by killing bacteria found in pores and also decreases the production of keratin. Dr. Michelle Park of Washington Square Dermatology thinks it?s fantastic because it has dual properties: not only is it great for acne, ?but it also basically stops the production of pigment in the skin.? MacGregor agrees and says that ?Azelaic acid has a subtle brightening effect.? Although typically prescribed by doctors (under the name Finacea, for example), azelaic acid can also be found over the counter. Try this ?multifunctional brightening formula? by The Ordinary. In addition to azelaic acid, New York dermatologist Dr. Cybele Fishman says that pregnant women can use ?topical erythromycin (prescription) and all over-the-counter topical sulfur, topical zinc, and topical niacinamide treatments.? Fishman recommends this sulfur-based acne medication called Acnomel, as well as this niacinamide and zinc blemish treatment from The Ordinary. Alpha Hydroxy Acids (AHAs) and Beta Hydroxy Acids (BHAs) are both popular types of skin exfoliants, but according to MacGregor, ?They disrupt the skin barrier and enhance penetration of other topicals including botanicals and other untested substances.? While she advises that it?s best to avoid them, there wasn?t a general consensus among the derms we spoke to on what types of acids within each category were safe. Some doctors advised avoiding them altogether (salicylic acid is a BHA, for example), while others, like Fishman, said that certain acids like glycolic, lactic, malic, and mandelic acids, are okay to use. Hyaluronic acid, though, is just fine. Park likes Neutrogena?s Hydro Boost gel cream, which contains hyaluronic acid. ?Hyaluronic acid is a natural substance found in our body?s tissues that?s naturally there anyway, so it?s not like introducing a foreign chemical,? she says. ?It has a lot of benefits of moisturizing and plumping up the skin, which can fight fine lines. It?s just an overall great moisturizer.? 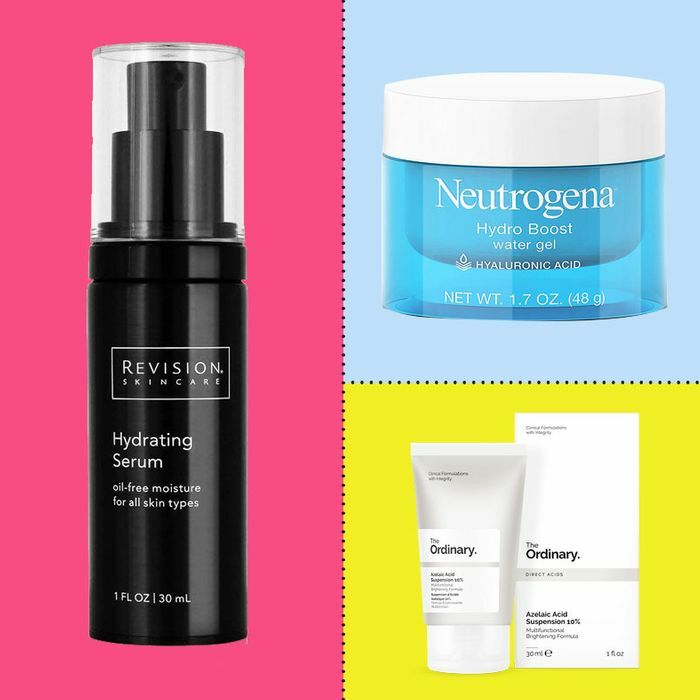 Strat beauty writer Rio Viera-Newton also wrote about her favorite hyaluronic acid products. Check out this affordable ?supersmooth, plumping? serum from The Ordinary that has ?all the deeply hydrating and moisturizing effects of a fancy serum, but at the best price ever.? For another face cream that contains the benefits of exfoliating acid, there?s Enhance Brightening Complex from Glytone. It?s one of Park?s favorite moisturizers and contains both azelaic acid and glycolic acid, which she says is fine to use during pregnancy. ?They help both with acne but also to even out skin tone.? For pregnant women looking for a safe and simple skin-care routine that will help to minimize acne flare ups, Dr. Arielle Nagler of NYU Langone recommends ?embracing good hygiene, like using gentle cleansers to remove makeup all the time,? and getting the occasional facial with extractions. For MacGregor, the best regimen includes ?a gentle cleanser, topical vitamin C, and a mineral SPF moisturizer.? She loves Elta 41 and Elta 44. (Park and Nagler also recommend choosing a physical sunscreen over a chemical one.) ?A good, bland moisturizer for evening is best,? she adds. For Dr. Nava Greenfield of Schweiger Dermatology Group in Brooklyn, moisturizers that are not anti-aging, which she says would likely contain an acid, are fine to use during pregnancy. She recommends Cerave moisturizer and SkinCeuticals? Triple Lipid cream, which she cautions is pricey. She also recommends Revision Skincare?s Hydrating Serum. ?Vitamin C is something I love to use in pregnancy or not,? says Park. ?Used in conjunction with sunscreen, it not only has properties that boost collagen production and has a retinol-like effect, but also works as an antioxidant that helps fight sun damage.? Try this Rio-approved formula from Drunk Elephant, which, though expensive, Newton calls ?one of the best vitamin-C serums I?ve ever used, and I?ve used a lot. It?s incredible for brightening and making your skin look clean and radiant. ?